Admiralty Dental Associates, P.A. 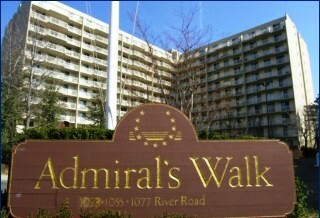 is located in the south tower of Admiral's Walk on the ground floor. We are on the east side of River Road, just north of the Edgewater Ferry and Route 5, right on the Hudson River overlooking the west side of Manhattan. There is ample parking directly in front of our office, with an overflow parking lot facing the river. As you enter the complex, a security guard is stationed to assist with parking.